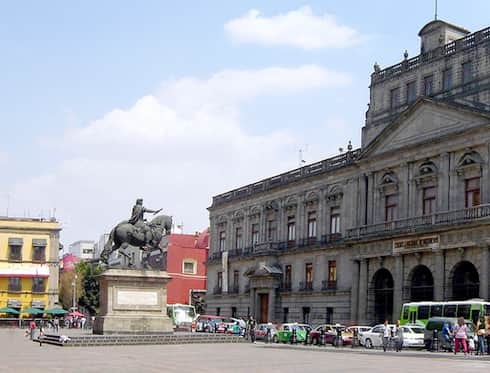 The Plaza Manuel Tolsá (also Plaza Tolsá) is a rectangular plaza that is located opposite the old Tacuba Street, within the confines of the area that comprise Mexico City's first Historic Centre. Its boundaries are the old Palace of the Communications and Public Works Office to the north, Tacuba Street and the imposing and majestic Palacio de Minería building to the south, an old 18th-century building to the east and the French-like Marconi Building to the west. To the southwest are the Callejón de la Condesa and the Palacio Postal, or Quinta Casa de Correos (Fifth Post House). The central part of the plaza is adorned by one of Tolsá's masterpieces, the equestrian statue of Charles IV riding horseback, commonly known by "El Caballito" (The Little Horse).